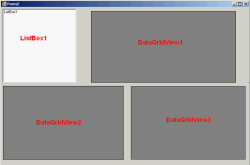 This part contents mostly concerns coding on VB.NET which will interacts with SQL server on pubs database. 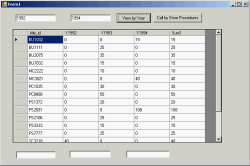 The sample database can be download at SQL2000SampleDb. You do not need to complete Part I before. 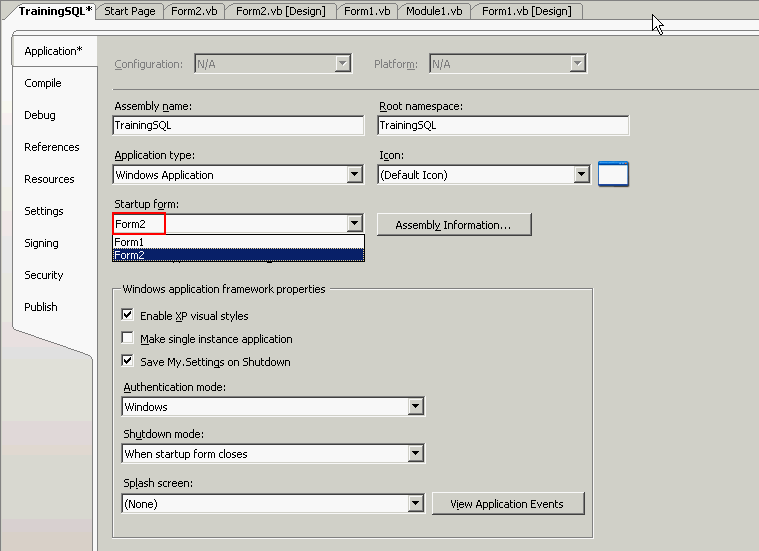 Create new VB.NET Windows Application project and add new module to the project for add a connection string to SQL server. You need to alter this string to match your environment and keep database pointing to pubs. Public Sqlcon As String = "Server=BKKSQL2005;uid=sa;password=123456;database=pubs"
Add new Textbox as TextBox1, TextBox2, TextBox3, TextBox4 and TextBox5 to the form. Add new Button as Button1 and Button2 to the form. 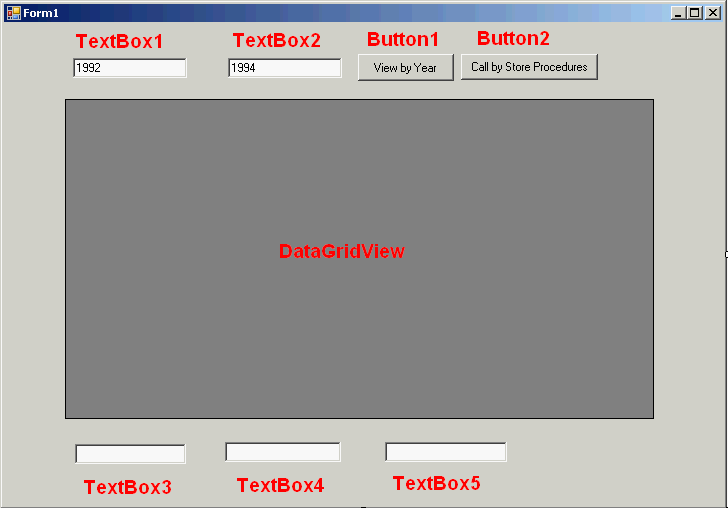 Add DataGridView to the form. Add code below on this form. Double click Button1 and put below code into it. Dim strsql As String = "select title_id "
strsql &= " from sales group by title_id with rollup"
Dim str1 As String = ""
If str1 <> "" Then str1 = str1 & "+"
Try compile and run the project, enter ‘1992’ on TextBox1 as start year and ‘1994’ on TextBox2 as end year and click the ‘View by Year’ button. Youâ€™ll see the result as below. 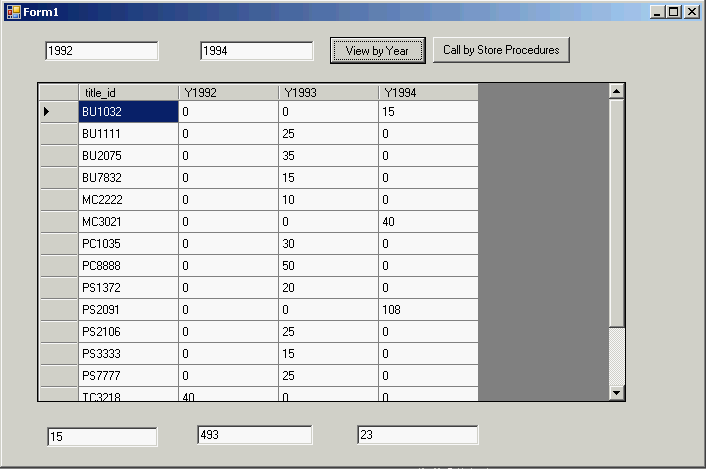 There are 3 different coding styles that will give the same result for calling store procedure. The example will try to call a store procedure â€˜test_aâ€™ which receive two inputs (start year and end year). From previous Form1, modify Button1_Click event to be one of these code. Sending parameters along with execute string. Dim strsql As String = "exec test_a '" & TextBox1.Text & "', '" & TextBox2.Text & "'"
Sending parameters by adding as SqlParameters. The result will look like previous example. You can download the modified source code at here – TrainingSQL2.zip. There are 3 different coding styles as like in previous example. Modify source in Form1.Button1_Click method with the following code again. Dim strsql As String = "declare @i int exec @i = test_a '" & TextBox1.Text & "', '" & TextBox2.Text & "' select @i as num1"
The result will look like previous example but add a pop-up message box the return value from the store procedure. 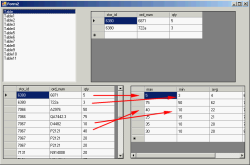 You can download the source code at here – TrainingSQL3.zip. This example, you need a store procedure â€˜test_a2â€™ which can be found here – test_a2.sql. This store procedure receives two inputs as the store procedure ‘test_a’ but it returns more additional values which are @sum1, @avg1 and a return value. There are 3 different coding styles as like in previous example. 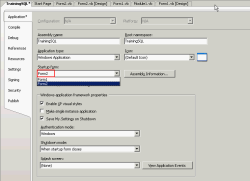 Modify source in Form1.Button1_Click method with the following code again. The additional values that are returned from the store procedure will be place into TextBox3, TextBox4 and TextBox5. Dim strsql As String = "declare @i int,@j int, @k int exec @i = test_a2 '" & TextBox1.Text & "', '" & TextBox2.Text & "',@j out, @k out select @i as num1,@j,@k"
Note: The parameter’s name must match as in the store procedure. The result will look like previous example but add a pop-up message box the return value from the store procedure. You can download the source code at here – TrainingSQL4.zip. 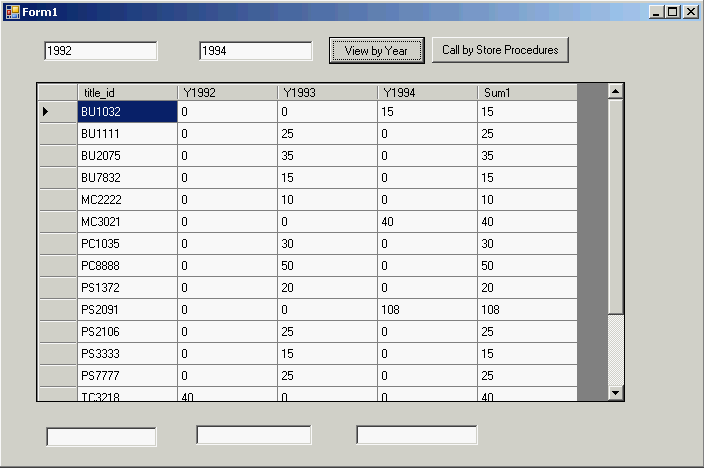 This example shows how to using function max, min and average by compute from qty field on sales table. Add new form on the project. Add new ListBox1 to the form. 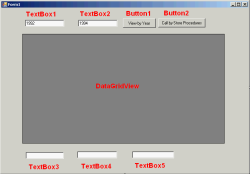 Add DataGridView1, DataGridView2 and DataGridView3 to the form. Add below code to the form.
" 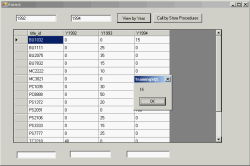 compute max(qty),min(qty), avg(qty) by stor_id"
Change startup form on the project by right-click on the project’s name and select properties and change startup form from ‘Form1’ to ‘Form2’. Compile and run the project. You’ll see that on DataGridView1 will be changed when you change value on ListBox1. On DataGridView2 shows result from sql query command and DataGridView3 shows computed values (max, min and average) of each stor_id. 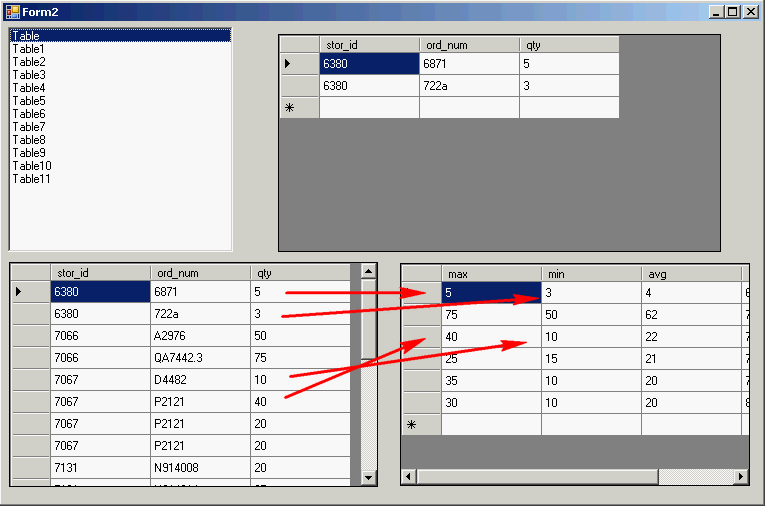 You can download the source code at here – TrainingSQL5.zip.